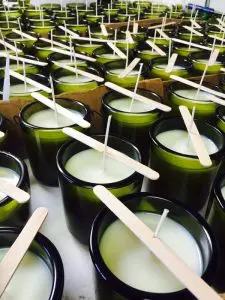 Thank you for considering our dedicated team and artisan body care and candle production facility for your next Custom Product Design Work. Our facility was the original home of The Sunfeather Natural Soap company from 1989 until 2011 when the brand was sold. We currently produce our new regional brand,“Adirondack Fragrance & Flavor Farm” and also offer Custom Product Design, development, and production services to over 40 custom and private label accounts. We hope to add you to our list of successful and satisfied clients! Under the creative design work and careful leadership of Sandy Maine, our company’s founder, our experienced team of production workers, product development and customer service people strive to bring you the beautiful products that are the lifeblood of your business! From shower gels and shampoos to all natural cleaning products to handmade soaps, balms, lotions, room sprays, candles (and more) our custom program offers quality and affordability. Select Farm-to-Product botanical materials from Sandy Maine’s farm. the vision for your brand and enhance sales for your specialty shop or business.